Remember when we talked about haupia? I’m a huge fan of this delicious Hawaiian treat. But then again, what’s NOT to love about coconut pudding? First things first, let’s just get one thing straight: eating chocolate for breakfast is perfectly acceptable when there’s fruit mixed in. Like this Double Chocolate Banana Bread. Totally breakfast food. Second thing: sometimes one type of chocolate just isn’t enough. For these special occasions, you’ve gotta go double or go home. Just trust me on this one. My husband’s family is in town for the holidays. And one of my favorite things about having house guests is the excuse to stock up the fridge and bake up a storm. I consider having a fully stocked kitchen and fresh baked treats on the counter integral in becoming hostess of the mostess. 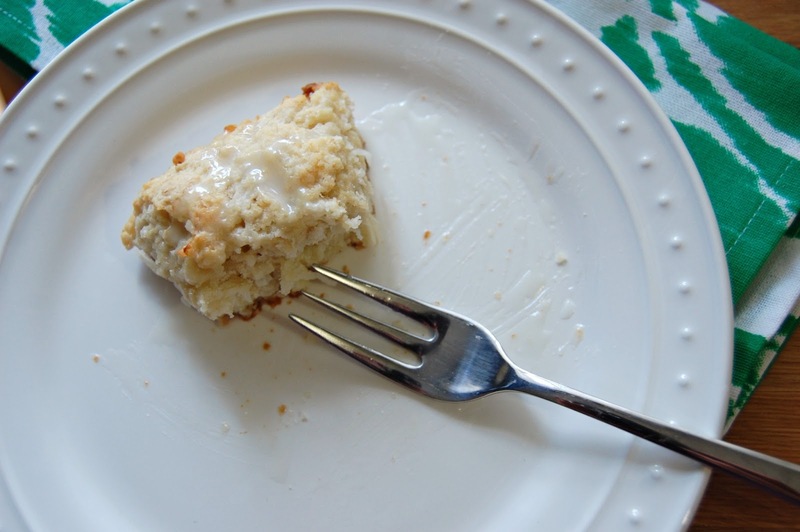 And speaking of baked treats, my father-in-law drinks black coffee like it’s going out of style – and he loves having a bite of something sweet to go along with it. So naturally, I figured coffee cake would be the perfect solution. With a holiday twist, of course. ‘Tis the season! So I added a Cranberry Pecan Streusel topping to my go-to Sour Cream Coffee Cake recipe. And, holy smokes. This recipe is a keeper. Remember that rant from last week? About baked donuts? Well guys and girls, the quest continues. And I have to tell you about another rockstar baked donut recipe that totally classifies as a good baked donut (however hypocritical it might sound): Baked Strawberry Donuts with Honey Bourbon Glaze. Although I’m not normally a huge fan of whisky, I recently discovered honey bourbon. And, I am a changed woman. It’s so yummy and smooth that apparently I thought it was a good idea to add to breakfast food. Oh wait, this has happened before, hasn’t it? Please don’t judge me. Baked donuts do not taste as good as traditional fried donuts. Buuuut they are a great healthier alternative for donut lovers, like myself. I’ve been experimenting like a mad scientist with my donut pan to find a baked donut that’s up to par. And let me tell you, it hasn’t been easy. I’ve thrown away more batches of donuts than I care to admit. 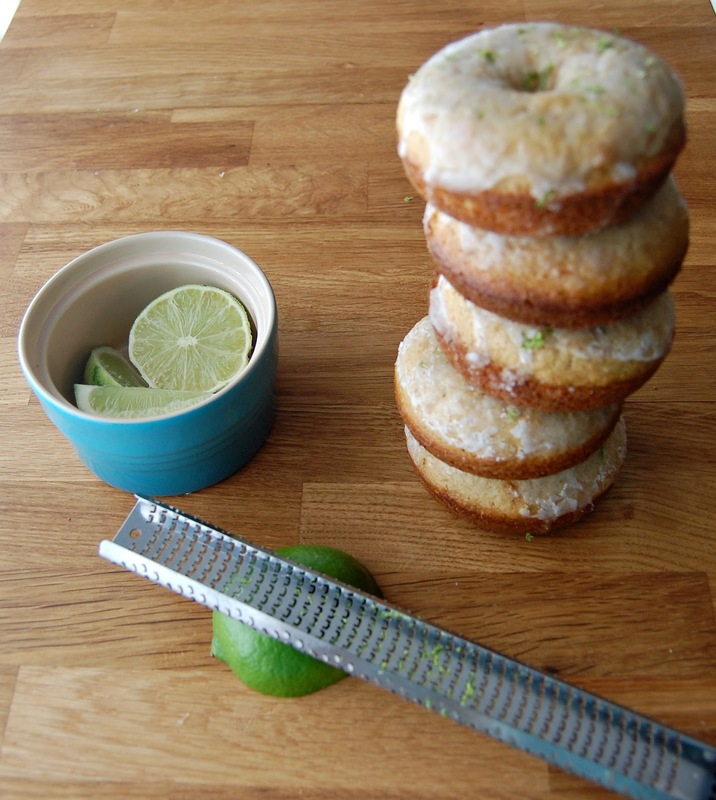 My Baked Margarita Donuts were a win, but a girl can only have tequila at breakfast every so often. Thankfully, I found another recipe keeper: Baked Coconut Donuts with Chocolate Almond Glaze. These donuts aren’t just good; they are insanely good. You literally wouldn’t know they are baked. They are extravagant and rich. And the roasted almond chunks deliver the necessary crunch of traditional donuts that baked donuts seem to be missing. And the coconut-chocolate-almond combination is totally reminiscent of Almond Joys – which happen to be my favorite candy bar. I don’t eat them often, but then again, you can’t eat Almond Joys for breakfast. Is it ever too early for tequila? No way, jose. Let me clue you in to two of my latest obsessions: my donut pan. And tequila. Okay, okay. Technically tequila has been on the list for a while. But who’s counting? Here’s the problem: you can’t add tequila to your coffee. Luckily, I figured out another way to add it to my morning routine. This is normal behavior, right? My husband maaaay have been slightly concerned about me when he came home to discover tequila-infused breakfast food on the counter – but one bite and he was hooked. The thing about these donuts is that they aren’t super boozy. They are light and citrusy and delicious. 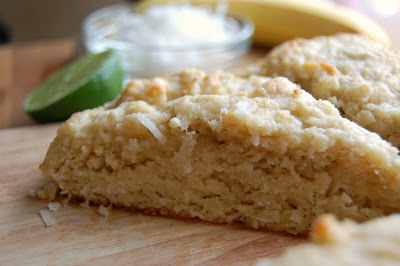 For those of you who loved my coconut banana bread scones with lime glaze, these donuts will be your new fave. Promise. Preheat oven to 425F. Spray donut pan with nonstick cooking spray. In a large mixing bowl, sift together flour, sugar, baking powder, nutmeg and salt. Add buttermilk, eggs, butter and lime zest. Beat until combined. Fill each donut cup 2/3 full and bake for 7-9 minutes. 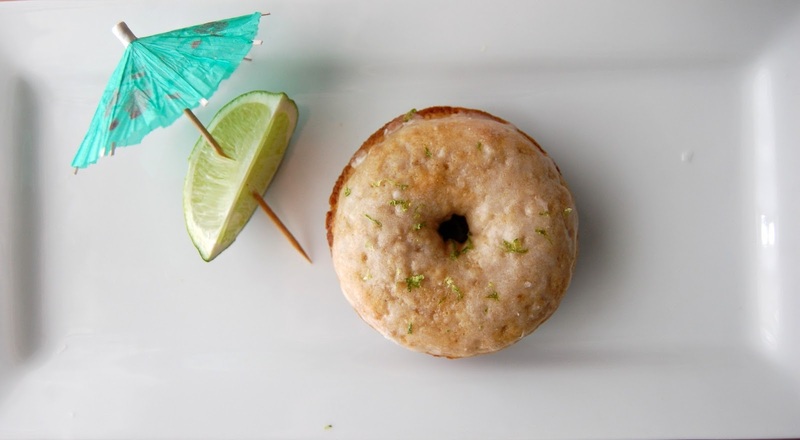 While donuts are baking, whip up the glaze, whisking the powdered sugar, lime juice and tequila together. When donuts are ready, dunk into the glaze and let cool on a baking rack. Garnish with lime zest and course salt before glaze cools completely. I miss living in France most on weekday mornings, while I’m eating oatmeal but dreaming of pastries and espresso. Sam would rather have a super hearty breakfast, so we’ve gotten in the habit of making large brunches on the weekends. Pancakes to omelets, waffles and bacon, we’ve done it all. 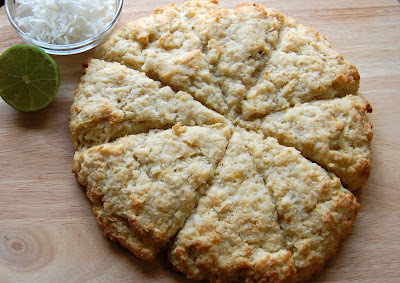 But this weekend I had a mad craving for homemade scones. Trying to get ahead of the game, I set to it on Friday night so that the scones would be ready to eat on Saturday morning. But as it so often happens, I realized too late that I was out of eggs. You think I’d learn to triple check ingredients before diving in, but noooo. I swear this happens once a week! The good news was that I had ripe bananas, so I swapped one in in lieu of the egg. Since I was modifying the recipe anyway, I threw in some leftover coconut from my thai lettuce wraps. 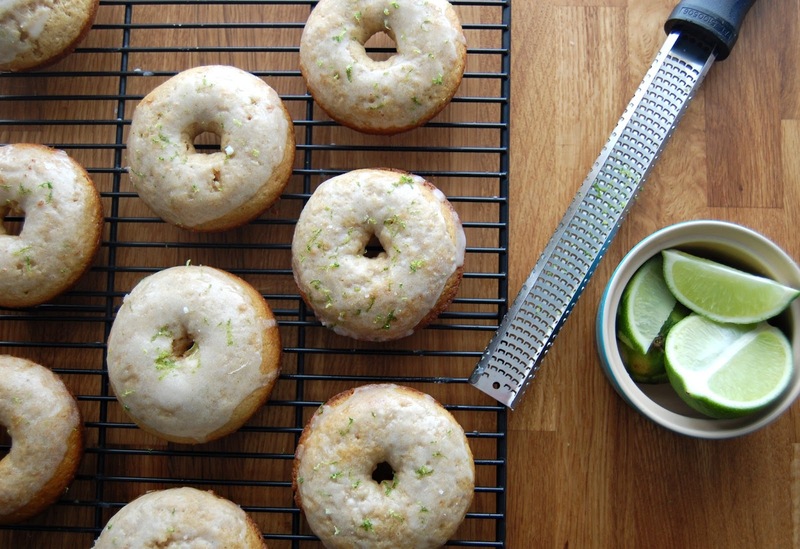 And because sometimes I just get carried away, I whipped up a simple lime glaze to finish it off. 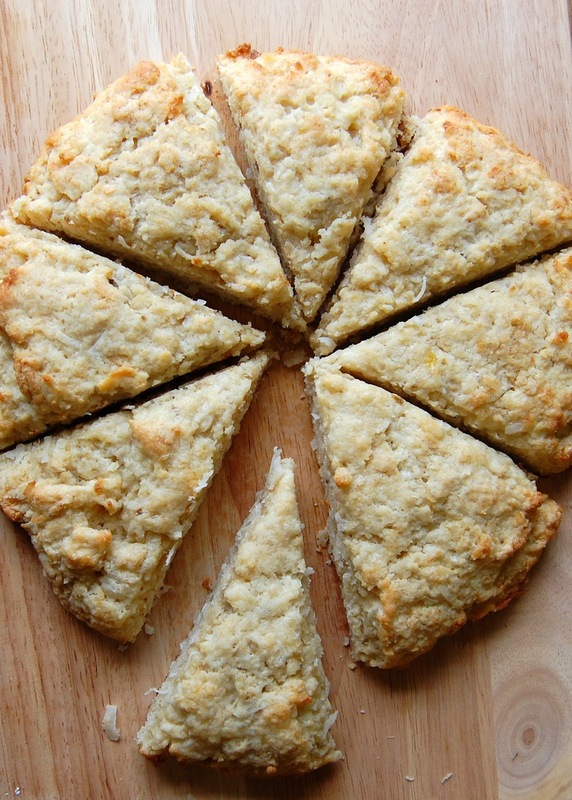 The scones are definitely less dry than classic scones, but not as cakey as typical banana bread… they are sorta the perfect combination of the two. You’ll want to eat these babies for breakfast, snack time, and dessert. Let’s just say that they did not last long in our home. Preheat oven to 400F. Put all ingredients in a large bowl. Use fork to stir together until large clumps form. Press dough into a large ball. Move ball to a lightly floured surface, and roll out to a 7-8 inch circle, 3/4 inch thick. Slice into 8 pieces, stopping just short of cutting all the way through dough. Bake for 15-17 minutes. 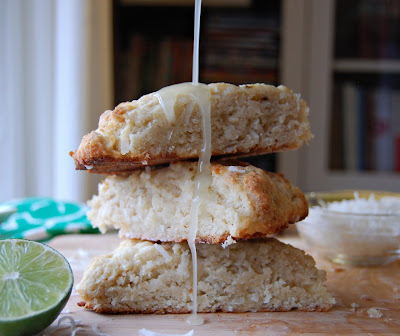 While scones are baking, whisk together powdered sugar and lime juice. Pour glaze over freshly baked scones and enjoy while hot!